Myllocerus undecimpustulatus undatus Marshall, the Sri Lankan weevil, is a plant pest with a wide range of hosts. This weevil spread from Sri Lanka into India and then Pakistan where many subspecies of Myllocerus undecimpustulatus Faust are considered pests of more than 20 crops. In the United States, the Sri Lankan weevil was first identified on Citrus sp. in Pompano Beach a city in Broward County Florida. Three specimens were identified by Dr. Charles W. O’Brien, first as Myllocerus undecimpustulatus, a species native to southern India, and then again as Myllocerus undatus Marshall native to Sri Lanka, finally as Myllocerus undecimpustulatus undatus Marshall to show its status as a subspecies. Figure 1. 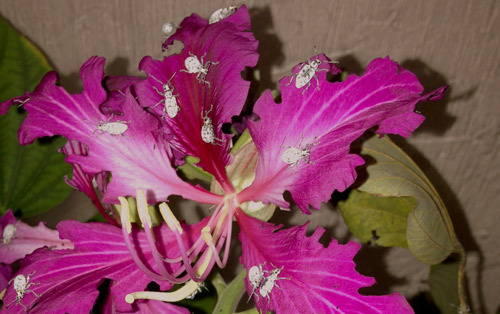 Sri Lankan weevil, Myllocerus undecimpustulatus undatus Marshall, adults on Hong Kong orchid tree, Bauhinia blakeana. Photograph by Anita Neal, University of Florida. The Sri Lankan weevil was first detected in 2000. 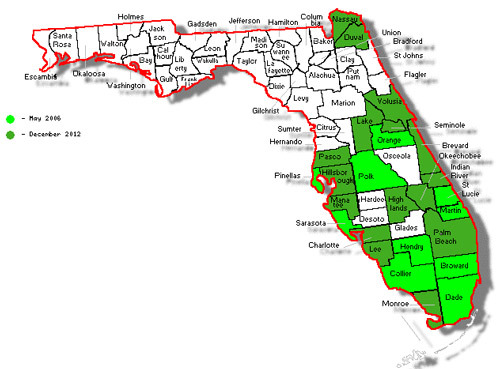 By May, 2006 it was found in 12 counties in Florida. 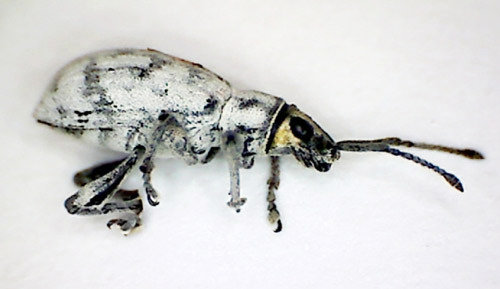 Michael Thomas of the Florida Division of Plant Industry has obtained data from field agents identifying this weevil in an additional 13 counties since May of 2006. It has not been determined how the Sri Lankan weevil arrived in south Florida. Figure 2. Distribution of Sri Lankan weevils, Myllocerus undecimpustulatus undatus Marshall, in Florida based on initial collection from 2000 to 2006, and additional data through 2012. Map created by Anita Neal, University of Florida. Adults: Adult Sri Lankan weevils vary in length from approximately 6.0 to 8.5 mm; the female weevil is slightly larger than the male by 1.0 to 2.0 mm. 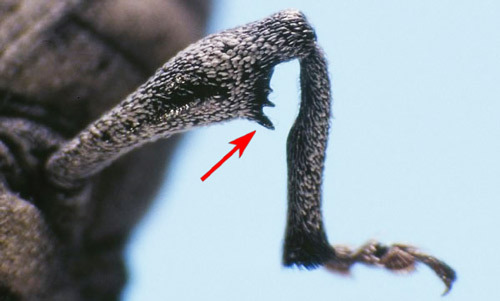 Some of the notable features of the Sri Lankan weevil are toothed femora (front and middle bidentate and hind femora tridentate), strongly angled humeri (shoulders, see red arrows in figures 3 and 6) are broader than the prothorax, the yellowish coloration of the head, and the dark-mottled dark elytra. These features help distinguish the Sri Lankan weevil from other weevils of similar size and coloration. Artipus floridanus Horn, the little leaf notcher, is most similar in appearance but the femora lack teeth, the humeri are not angled, and the elytra are grayish to white, with smaller black cuticular marks formed by perforations on the elytra. Figure 3. Adult Sri Lankan weevil, Myllocerus undecimpustulatus undatus Marshall, with angled humeri and dark mottled elytra. Photograph by Anita Neal, University of Florida. Figure 4. Adult Sri Lankan weevil, Myllocerus undecimpustulatus undatus Marshall, with yellowish coloration of head. Photograph by Anita Neal, University of Florida. Figure 5. Adult Sri Lankan weevil, Myllocerus undecimpustulatus undatus Marshall, hind femur with spines. Photograph by Paul Skelley, FDACS-Division of Plant Industry. Figure 6. Adult Sri Lankan weevil, Myllocerus undecimpustulatus undatus Marshall (left) comparison with the little leaf notcher, Artipus floridanus Horn (right). Photographs by Paul Skelley, FDACS-Division of Plant Industry. Eggs: Female Myllocerus spp. may lay up to 360 eggs over a 24-day period, and larvae emerge in 3-5 days. Sri Lankan weevil eggs are laid directly on organic material at the soil surface, which is common for most Myllocerus spp. Eggs are less than 0.5 mm, ovoid and usually laid in clusters of 3-5. The eggs are white or cream-colored at first, then gradually turn brown when they are close to hatching. Larvae: The larvae range in size from 1.09 ± 0.05 mm as first instar larvae to 4.0 ± 0.05 mm as fourth instar larvae and are beige-white with a reddish brown head. They burrow into the soil where they feed on plant roots for approximately one to two months. The larvae pupate in the soil for approximately one week. Figure 7. 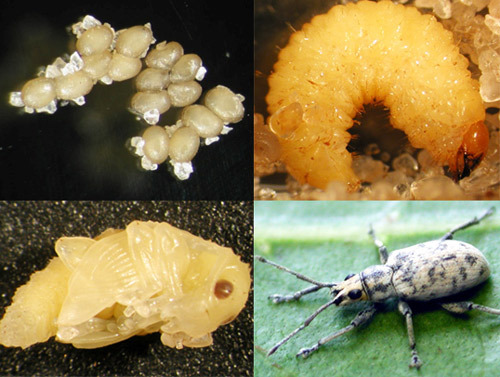 Life cycle of the Sri Lankan weevil, Myllocerus undecimpustulatus undatus Marshall, eggs, larva, pupa, and adult life stages. Photographs by Holly Glenn, University of Florida. The Sri Lankan weevil has a wide host range of over 150 plant species including native, ornamental, vegetable and fruit species. Some host plant examples include Citrus spp., citrus; Conocarpus erectus, green buttonwood; Bauhinia x blakeana, Hong Kong orchid tree; Chrysobalanus icaco, cocoplum; Phoenix roebellenii, pygmy date palm; Prunus persica, peach; Lagerstroemia indica, crepe myrtle; Capsicum spp., pepper; Litchi chinensis, lychee; Muntingia calabura, strawberry tree; and Solanum melongena, eggplant. It is unclear what the larval host plants are, but they have been reared in the laboratory on pepper, eggplant, cotton, carrot, and sweet potato roots. Figure 8. Adult Sri Lankan weevil, Myllocerus undecimpustulatus undatus Marshall, feeding damage on Terminalia catappa L., tropical almond. Photograph by Susan Halbert, FDACS - Division of Plant Industry. Leaf-feeding adults damage the foliage of ornamental plants, fruit trees, and vegetables, whereas the larvae injure root systems. Due to its feeding habits, the Sri Lankan weevil could negatively affect subtropical and tropical fruit, ornamental, and vegetable industries here in Florida. The possible impact to the horticulture industry in nurseries, landscape services, and horticultural retailers could reach billions of dollars based on the value they generate in Florida (Kachatryan and Hodges 2012). 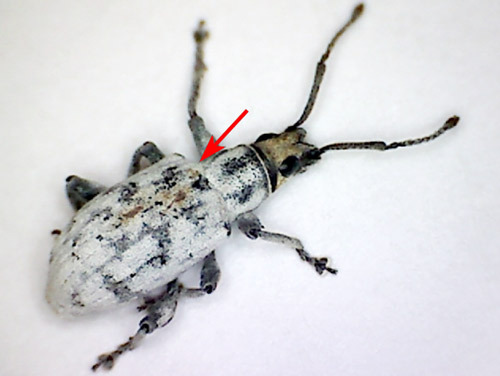 Extension agents and Master Gardener volunteers around the state have received requests from homeowners for information on the control of this weevil. Botanical gardens and plant nurseries have reported damage due to chewing injury and require effective control measures. 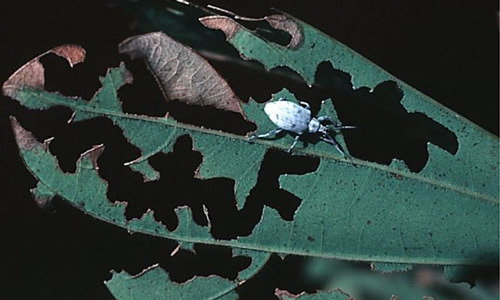 When adult weevils feed on leaves, they feed inward from the leaf margins (or edges), causing the typical leaf notching. There are some instances where the leaf material is almost completely defoliated, where the weevil has fed along the leaf veins. The adults prefer new plant growth. Intense feeding by numerous weevils may cause plant decline or stunting. Young seedlings may not survive a large amount of feeding damage. 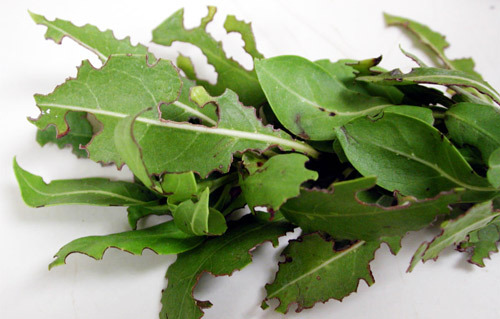 With healthy plants, however, the feeding damage may be considered cosmetic if the plant recovers. Figure 9. Adult Sri Lankan weevil, Myllocerus undecimpustulatus undatus Marshall, feeding damage on Conocarpus erectus L., green buttonwood. Photograph by Holly Green, University of Florida. Traditional methods of control include pesticides, many of which provide only limited management of this pest. Chemical control of the adults is difficult because of their ability to fly, hide, or feign death and drop to the ground. Chemical control of the eggs, larvae, and pupae is more difficult due to their location on or in the soil. 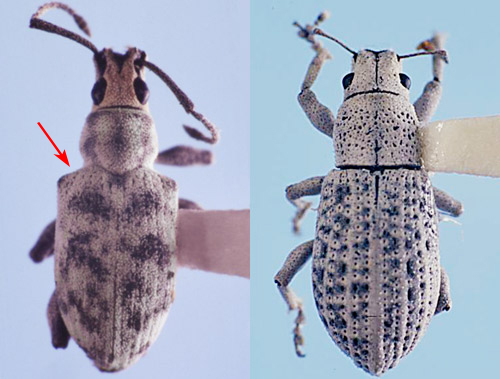 Adult weevils can be removed from plants by vigorously shaking a branch over an open, inverted umbrella. The collected weevils can then be dumped into a container of soapy water. As insecticide recommendations and regulations are updated yearly, it is advisable to consult a local Extension Service office or a pesticide reference guide for current information on control methods for this pest. Arevalo HA, Stansly PA. 2009. Suppression of Myllocerus undatus (Coleoptera: Curculionidae) in Valencia orange with chlorpyrifos sprays directed at ground and foliage. Florida Entomologist 92: 150-152. Atwal AS. 1976. Agricultural pests of India and South-East Asia. New Delhi, India: Kalyani Publishers. pp. 295-296. Epsky N, Walker A, Kendra PE. 2009. Sampling methods for Myllocerus undecimpustulatus undatus (Coleoptera: Curculionidae) adults. Florida Entomologist 92: 388-390. Josephrajkumar A, Rajan P, Mohan C, Thomas RJ. 2010. First record of Asian grey weevil (Myllocerus undatus) on coconut from Kerala, India. Phytoparasitica 39: 63-65. Acknowledgements: Special thanks to Morgan Byron, Dr. Ron Cave, Dr. John Capinera and Dr. Howard Frank for their review of this document. Publication Date: November 2013. Reviewed: April 2017.